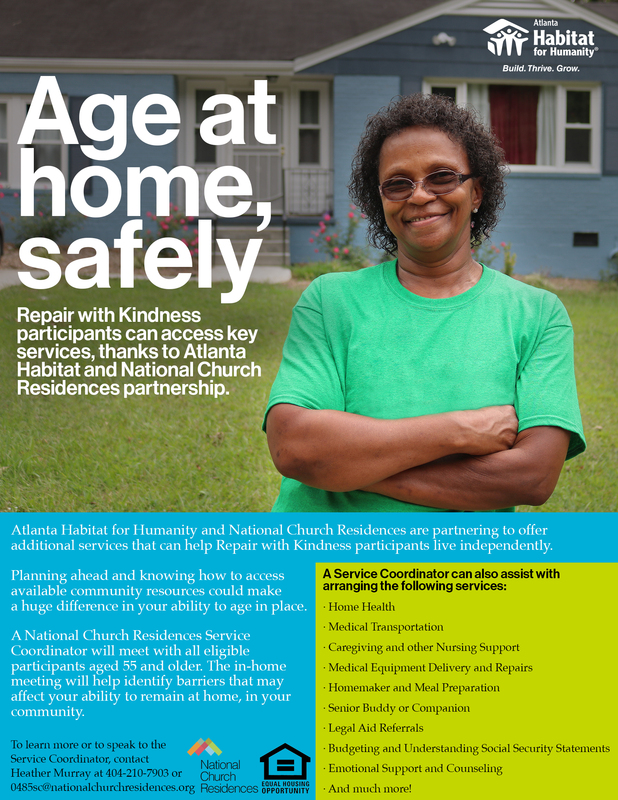 Atlanta Habitat for Humanity and National Church Residences are partnering to offer additional services that can help Repair with Kindness participants live independently and stay home for life. The Repair with Kindness program helps qualified homeowners age 55 or older make critical home repairs that reduce health or safety hazards or improve weatherization for residents. A National Church Residences Service Coordinator meets with homeowners identified by Habitat for Humanity and uses Care Guide to assess the needs of community seniors. This program is a great addition to what National Church Residences is doing in the building in Atlanta. This program enables us to reach those who may not live in our buildings but need help identifying services. Many seniors prematurely enter nursing facilities because they are unaware of the services that are available to them or they have no one to assist them. Our Service Coordinator visits these residents in their homes and helps determine what each person needs. Recognizing that every person is unique, the Service Coordinator takes time to get to know the resident’s health and social needs. They then can arrange a variety of services, including Home Health, Legal Aid Referrals, Budgeting and Financial Literacy training, Emotion Support and more. This partnership with Atlanta Habitat for Humanity allows us to extend our reach in the Greater Atlanta and surrounding communities, helping us to continue with our mission to enable seniors to stay home for life.